Q. 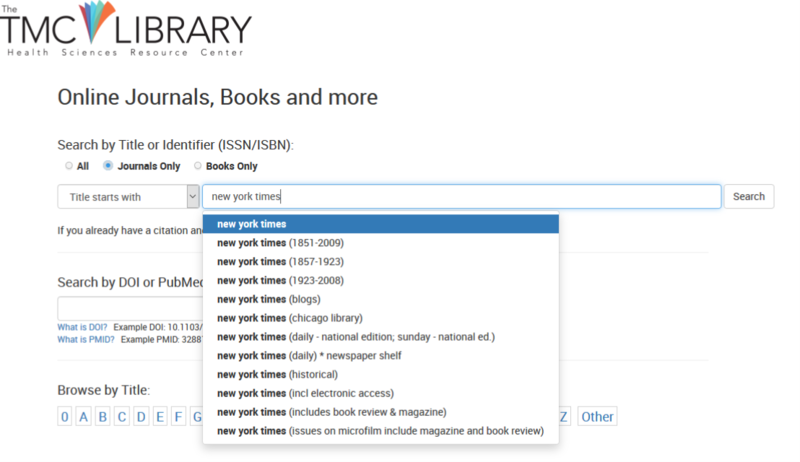 Does the TMC Library provide access to the New York Times or the Washington Post? The Texas Medical Center Library provides access to the New York Times and the Washington Post through the TexShare Science in Context database. Please note that the content from these publications in this database does not include images or infographics. Enter the name of the publication in the Search field and click the Search button. The search result indicates which resource has coverage of the publication. You can see here that the coverage for the New York Times goes back to 1985. Click Science in Context to advance to that database. You will be taken to an "About This Publication" page. From here, you can search within the publication using the search field at the top, or browse issues by selecting the year and date under Full Text Coverage. A single issue will appear as a collection of news articles. The number in parentheses indicates the number of results in a search. Click News to display more article titles. When you select an article, the full text will be displayed.